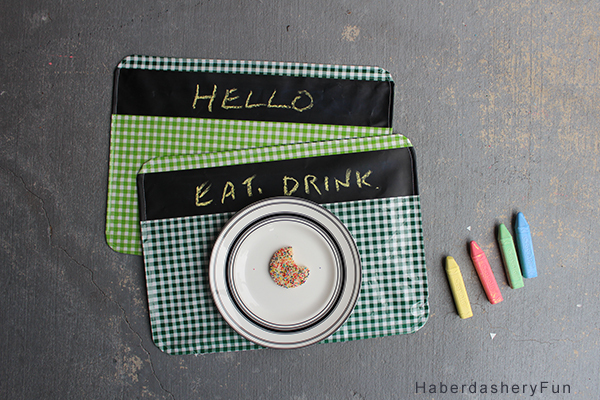 Can you imagine a dinner party with these fun placemats? How about a birthday party? These placemats were inspired by my messy, marker wielding toddler.. 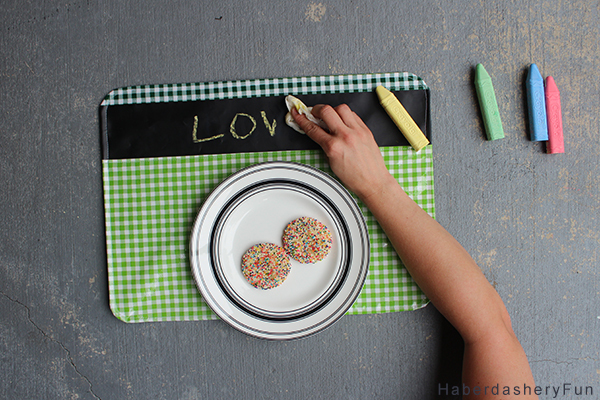 They combine oilcloth for cleaning ease and chalkboard fabric for pre-dinner entertainment. 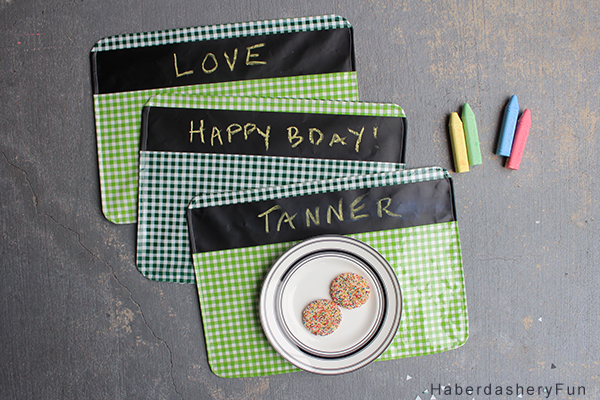 However, the placemats would work for any age group. Imagine the interesting comments after a few glasses of wine at an adults only dinner party? I have a few ideas on what people might write and do.. but I’ll leave it up to your imagination. 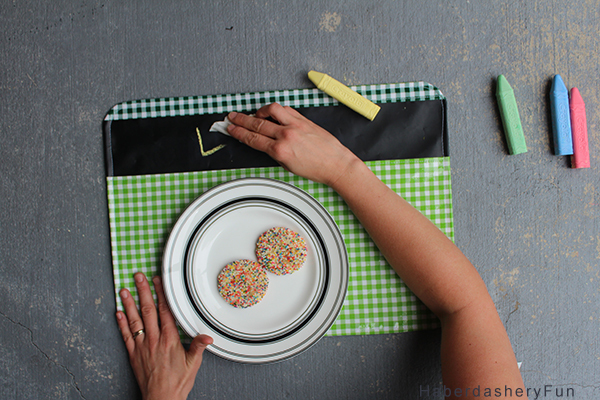 I love how you can just wipe the chalkboard fabric clean..
Let get started on the tutorial. Note: I cut my placemat back pieces out of the oilcloth fabric. While I love the mix and match feel, it was difficult to sew. Try cutting the placemat back pieces out of cotton. 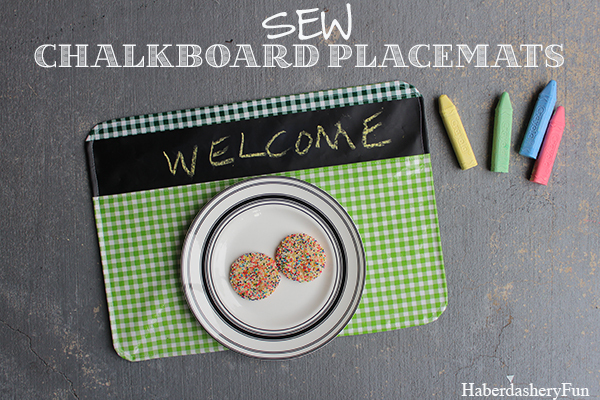 Trust me, it will be easier gliding the placemats through your sewing machine. Right sides together, lay the the placemat top rectangle onto the chalkboard rectangle. Place into sewing machine and stitch together with a 1/2″ seam allowance. If you need to pin the pieces together, make sure t0 pin in the seam allowance. Finger press the seam to lay flat. Place into sewing machine and edgstitch along the oilcloth. Right sides together, lay the the placemat bottom rectangle onto the chalkboard rectangle. Repeat as #1 and sew together. Repeat as #2 and finger press and edgstitch. Place 1 placemat onto working surface, right side facing down. Measure inwards 1/2″ at each edge and make an cross at each corner. Place the cup on the cross and trace to round the corner. Repeat for all corners – front and back placemat pieces. Be as precise as possible. This will help your corners be consistent and smooth. Place into sewing machine and stitch together with a 1/2″ seam allowance. Leave a large opening along the bottom edge. Trim and notch the corners. Turn right side out. Use your fingers to help round each corner into place. Finger press along the outside seam to lay flat. Turn the bottom opening seam allowance under 1/2″. Place into sewing machine and topstitch around the outside edge. I’ll leave you with a few fun sayings..
Sooo neat! What great gifts these will make! <3 these! 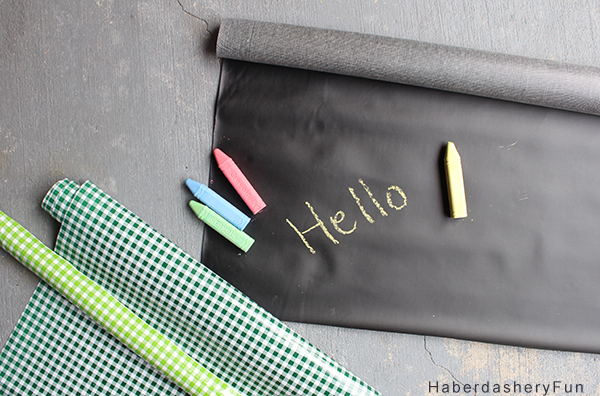 I have a stash of chalkboard fabric to use! This would be the perfect project for them! Thanks for the inspiration. Oh, how adorable! 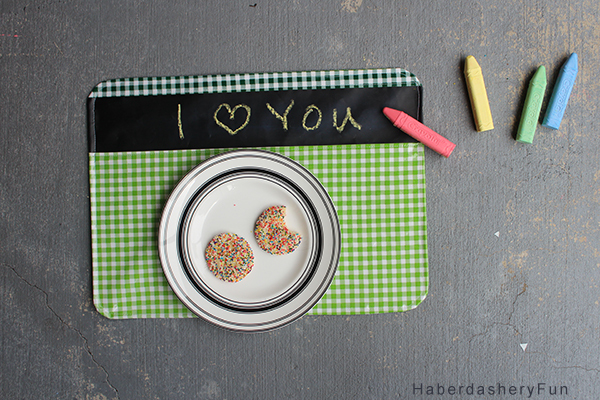 And perfect for fidgety little hands at the supper table-adults and kiddos! Thanks for sharing at Fridays Unfolded. Just pinned! How adorable is that!!! So FUN!! Thanks for sharing at The DIY Dreamer. Thank you so much. They were fun to make and imagine the dinner parties and sayings people would write.. lol. Have a great week. So much fun! I love these–thanks for linking to the Do Tell Tuesday party; I’m featuring you tomorrow!